Wedding bells are ringing at sea!!!! 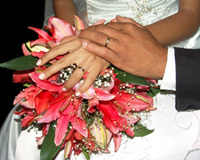 Many couples dream of a very special wedding, a "one-of-a-kind", which will be perfect in every way. Most people choose traditional churches, halls, temples or hotels, but what about an alternative? Consider a Tie the Knot wedding aboard ship! And just think! When the most important day of your life has come to a perfect conclusion, your honeymoon cruise is just beginning. Can you imagine anything more romantic than to get married by the ship's Captain during a fabulous cruise that takes you through Venice, Florence, Monaco and Athens? Or maybe the sparkling Caribbean islands of St. Thomas or St. Maarten appeal more to your sense of excitement and romance. In either case, you will be turning moments into memories that will last a lifetime. As the first line allowed to perform legal at-sea weddings, Princess Cruises offers all-inclusive wedding and honeymoon packages aboard most of their ships. What a great idea - being able to combine the wedding ceremony and honeymoon vacation into one 7 to 12 day event, with a free wedding consultant to boot! Many ships offer a beautiful wedding chapel on board. Your candlelit ceremony will be officiated by the Captain of the ship. The At Sea Wedding Package also includes special vows, a Wedding coordinator, live music, charnpagne and two Princess keepsake champagne flutes, a dozen roses bridal bouquet and matching groom's boutonniere, a photo package, wedding cake, two fresh floral arrangements, a Keepsake wedding certificate and a special lithograph painting of the ship signed by the captain. In select ports, you can also choose an onboard ceremony that takes place before the ship departs, where friends and family can also attend. Then, after the wedding, wave goodbye to everyone as you sail away on your fabulous Honeymoon cruise! The Harborside Wedding Package includes priority check in for couples and guests, a local officiant, romantic vows, wedding coordinator, pre-recorded music, photographer and one 8x1 0 photo, two silk floral arrangements, "half dozen rose bouquet and boutonniere, wedding cake, champagne and keepsake wedding certificate. An Ashore Wedding Package is also available, as well as many other upgrades and options. Many couples choose to bring family and friends along to be together in a romantic setting to share in this important event. If that's not possible, Princess now offers another exciting option: a live "Wedding Cam" in the wedding chapel. If you choose, your friends and family can watch your wedding, live, from the comfort of their own living room, on the family computer. And don't forget vow renewal ceremonies. This is another way for couples and families to celebrate this memorable event. Other cruise lines also offer weddings at sea. Royal Caribbean, Carnival Cruise lines, Norwegian Cruise Lines, Celebrity Cruise Lines, and others all offer similar packages.